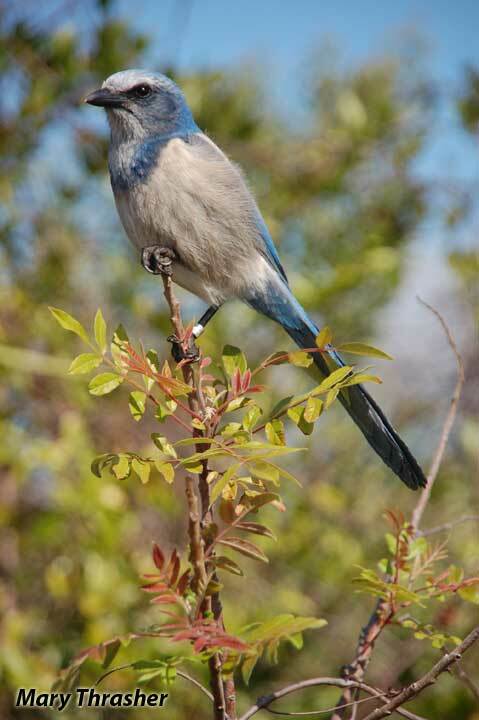 AUDUBON'S FIELD GUIDE TO BIRDING TRAILS (page 5): Great Florida Birding Trail: "This trail's biggest star by far, the Florida scrub-jay, is a striking blue bird found nowhere else in the world. These jays have a reputation for being practically fearless of humans, so your odds of seeing at least one–if not a constellation's worth–are quite good." Cornell Lab "All About Birds"
Birding area maps and bird count tables. Andy Blankert's report on his triumphant experience at the 2007 World Series of Birding. 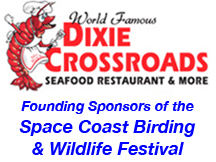 Discover more than 50 of Florida's Great Space Coast Birding Sites with descriptions & maps. If you are a birdwatcher, welcome to Florida birding paradise! Strategically located on the Eastern Continental Flyway, a major bird migration corridor, the region provides prime stopover habitat for many migrating shorebirds, waterfowl, raptors, and passerines. In fact, more than 330 species of birds have been seen here. Thousands of birds migrate from their northern homes to spend the winter here. The painted bunting, North America's most colorful bird, is a winter resident. The Space Coast is also home to one of the largest populations of Florida Scrub-Jays remaining in the state. The fastest growing passive sport in America, birdwatching is an activity that can be enjoyed by families, groups and individuals. Birding is easy and inexpensive, requiring minimal equipment, skill or physical fitness. With its diverse habitats and favorable climate, it is easy to see why the Space Coast is among the best birding locations in North America. Featuring numerous charismatic and colorful birds, easily seen and identified with a field guide, this area appeals to beginning birders as well as experts. The animated reddish egret (the rarest heron in North America), spectacular roseate spoonbill (the pink bird that many assume is a flamingo) and the imposing bald eagle are not as common in other areas as they are on the Space Coast. Other avian species coveted by experienced birders can be seen along the Space Coast. They include the northern caracara, snail kite, swallow-tailed kite, peregrine falcon, black rail, brown-headed nuthatch, Bachman's sparrow, red-cockaded woodpecker and many more. Another magical opportunity is the possibility of spotting pelagic seabirds in fall and winter. On days with strong winds from the northeast or east, northern gannets and jaegers may be seen offshore or even from the beach. Tropicbirds and magnificent frigatebirds are sighted occasionally. Support the Red, White & Blue. More than 50 birding sites are arranged generally from north to south and are grouped isto six sectors. Copy them from near the end of the site description. Open your Google Maps. Enter the coordinates in the search box at the top. Or, click on the maps provided to see each location mapped. You can lay out directions from these maps. INDEX of Birding Sites — Maps at heading for each area. Click map icon for a Google map to the Volusia County birding sites. Located on the south side of Ponce Inlet, this Volusia County park offers panoramic views of ocean, inlet and estuary via two miles of boardwalks which wind around its perimeter. On a leisurely stroll, you can spot a variety of birds without ever leaving the boardwalk as it passes through hammock, which is good for warbler landfalls in fall and spring, then on to the oceanfront where you can check the beach for loafing gulls, terns, and shorebirds and scope the water for loons and ducks. Along the western side of the park, boardwalk spurs lead out to the estuary, passing through a salt marsh area where sharp-tailed sparrows are sometimes seen. Watch for some of the numerous gopher tortoises as you pass over pristine coastal scrub habitat. Low tide is the best time to visit Smyrna Dunes, especially in winter, when exposed mudflats in the estuary attract massive numbers of coastal birds. Winter is also a good time to look for delicate small shorebirds, like endangered piping plovers, Wilson's plovers and semi-palmated plovers, which are occasionally seen scurrying along the shoreline. Baitfish activity attracts numerous gulls and terns as well as northern gannets. These large black and white seabirds put on a spectacular aerial display as they crash into the ocean near the inlet's mouth. The rock jetty is a good place to look for purple sandpipers. Across the inlet is a beautiful red brick lighthouse. Completed in 1887, the old Mosquito Inlet Lighthouse, now known as the Ponce Inlet Lighthouse, is a National Historic Landmark. At 175 feet, it is the second tallest lighthouse in the U.S. and the tallest lighthouse open to the public. Directions: From I-95 or US 1 in New Smyrna Beach, take SR 44 east to Canal St. Turn left (north) onto Riverside Dr. and then right onto Flagler Ave., crossing the Halifax River to the barrier island. Just after crossing the bridge, turn left onto North Peninsula Dr. The park is two miles north, at the end of the road. There is an entrance fee of $5.00. For information visit Website, or call 904-424-2935. The unique feature of Volusia County's beautiful Riverbreeze Park is a keyhole dock that passes over an oyster bar and extends out into Mosquito Lagoon. At high tide, the area may seem quite unremarkable, but at low tide, mudflats are exposed in and around the keyhole, where shorebirds like avocets, godwits, dunlin, red knots and dowitchers feed close to the viewers above. This is a good site to practice coastal bird identification in fall and winter when exposed sandbars also host loafing gulls, terns, black skimmers, pelicans and wading birds. Keep a close watch for oystercatchers. Check the tide tables the night before your visit so you can plan your route accordingly. Camping is permitted. Directions: From the blinking caution light on US 1 in Oak Hill, go north about two miles. Turn right on H.H. Burch Rd. The park is located at the end of the road on the north (left) side. Visit website or phone 386-345-5525. Click map icon for a Google map to the Northern Brevard County birding sites. A remote 3.05-acre community river park that accesses the Indian River Lagoon. The nearby 28,000-acre Seminole Ranch Conservation Area, like Buck Lake, yields the best experience when time and energy are invested in hiking the property's extensive trail system. A variety of habitats are found here including pine, palmetto, hardwood hammocks, freshwater lakes, river and wetlands. The hammocks and wetlands are thick with everything from migratory songbirds and painted buntings to turkeys and wading birds. King, clapper and sora rails, among others, can be found in the marshes where the property borders the St. Johns River. Certain areas within Seminole Ranch CA have a unique plant community supported by connate saltwater which flows from underground springs near Harney and Puzzle Lakes. The salinity of small lakes in the area sometimes approaches one-third that of seawater. Many salt-tolerant and marine-dwelling organisms present here are not found anywhere else in the St. Johns River, including the elusive black rail. A trail on the east side of Hatbill Road about two miles south of SR 46 leads to an observation tower where you'll find outstanding views of surrounding lakes and marshes. For information, call 386-329-4404 or visit Seminole Ranch Conservation Area. For a great hiking experience, the 9,600-acre Buck Lake Conservation Area west of Mims is fruitful if you invest time and energy in exploring its extensive uplands. Consisting of natural woodlands and wetlands that were historically used for pine and hardwood timber production and cattle ranching, this area was also used as the personal hunting preserve for the ranching family that formerly owned it. To ensure better hunting, the woodlands here were better preserved than on many of the neighboring properties which were heavily logged. The ridge found in the eastern part of the property supports about 200 acres of scrubby flatwoods and oak hammocks that provide suitable habitat for Florida scrub-jays. A basin swamp community dominates the eastern third of the property. The western portion of the property features a large floodplain marsh and a marsh lake, Buck Lake. There is an observation tower on the southeast side of Buck Lake, accessible from the second parking area. Sought-after species here include king rail, swallow-tailed kite, Bachman's sparrow, brown-headed nuthatch, Carolina chickadee, wild turkey, eastern bluebird, bald eagle, wood stork and red-headed woodpecker. You might also see alligators, gopher tortoises, indigo snakes, bobcats, otters, deer and gray fox. Migratory months are most productive and most comfortable. Be aware that there is also some hunting on the property during these times, so call ahead for hunt dates or check the entrance kiosks before you bird. This property is large and wild, so be sure to pick up a map at the kiosk and take water along on your hike. Directions: Three parking areas can be accessed from SR 46 west of Mims. From the I-95/SR 46 interchange: The first parking lot is located approximately one mile west on SR 46 on the north side of the road. The second parking area is located about 6.5 miles west on SR 46 on the north side of the road. The third parking area can be accessed by going approximately 10 miles west on SR 46 then turning right on Morgan Alderman Road and going about 0.25 miles; the parking area is on the east side of the road. For more information and a map of the area, visit Buck Lake Conservation Area, or call 386-329-3304. For hunt information, call 352-732-1225. Miles of roads will keep you exploring the rugged Salt Lake WMA all day. Pine flatwoods, scrub, freshwater marshes, lakes and salt flats shelter 200 plus bird species. On the east side near South Lake, several Florida Scrub-Jay families are present, thanks to ongoing habitat restoration efforts. Hikers may use the walk-in entrance (limited parking available) off Dairy Rd. for quicker access to the scrub and a spur trail to the northwest side of South Lake. Wading birds (Wood Stork, Roseate Spoonbill, night-herons, bitterns and egrets), waterfowl, rails, pelicans, gulls and terns may be found around the numerous lakes, the marshes and the St. Johns River. The secretive Black Rail and the uncommon Reddish Egret sometimes occur here. Watch for breeders such as Black-necked Stilt, Glossy Ibis, Osprey, Cooper's Hawk, Hairy Woodpecker and Indigo Bunting. Shorebird activity can be high in spring, fall and winter, particularly along the brackish Salt Lake and its adjacent salt flats on the northwest side of the WMA (you may drive to this lake year-round; bring a spotting scope). Seasonal hunting occurs at this GFBWT site; please click here for dates, regulations and more information. On the main portion of the WMA, vehicles are permitted during hunting season only. Otherwise access is by foot, bicycle or horseback. Restrooms are available at the check station near the main parking area on Arch Rd. Download maps from the FWC and SJRWMD websites below prior to visiting, as WMA roads are numerous and can be confusing. Portions of roads may be wet at times. Bring appropriate footwear, plus food, water and sun protection. St. Johns River WMD website. Directions: From I-95, take exit 223 for SR 46 and go west for approx. 0.4 mi. Turn left (south) on Turpentine Rd., and after 1.2 mi., turn right (west) on Panther Ln. Drive 0.4 mi. and turn left (south) on Arch Rd. ; the main parking area is 0.25 mi. ahead. For the walk-in entrance, follow Turpentine Rd. south and turn left on Guil Rd. (before reaching Panther Ln.). Go 0.2 mi. and turn right (south) on Ford Rd. Travel 0.5 mi. to Dairy Rd. and continue south, then east, on Dairy Rd. ; the entrance is 0.2 mi. ahead on the right (south) side. To reach the salt flats and Salt Lake any time of year, drive 0.75 mi. due west of the main parking area on Paces Landing Rd. Turn right (north) on Salt Lake Rd. and go 0.5 mi. ; the road dead ends at the lake. Note: Paces Landing Rd. and Salt Lake Rd. are not labeled or shown on some maps. Further west of Buck Lake and Seminole Ranch Conservation Areas is the Little-Big Econ State Forest. A partnership project between the St. Johns Water Management District, the Florida State Conservation and Recreation Lands Program and Seminole County, the area includes one of Florida's most beautiful blackwater streams, the Econlockhatchee River. Eventually the Little-Big Econ State Forest will provide a wildlife corridor connecting the southern part of the Econlockhatchee River Basin to the Tosohatchee State Reserve and other District lands along the St. Johns River for approximately 100 miles, from SR 46 south to the Florida Turnpike. The Florida Trail Association has developed miles of hiking trails throughout the Forest; a portion of the Florida Trail runs though it. Alligators are a common sight. This property has two tracts that are good for birding. The Demetree Tract has two entrances; the south entrance is off of Snow Hill Road and the northern Barr Street entrance is off of CR 426. The Snow Hill Road entrance has a parking area surrounded by improved pasture and a visitor center with maps and forest information. Start by birding the pasture for meadowlarks, bluebirds, sparrows and raptors, and then follow the trail southwest to the river boardwalk. A trail snakes along and through the treeline that borders the Econ, offering excellent birding for a diversity of resident and migratory songbirds like summer tanagers, blue grosbeaks, black-throated blue warblers and Philadelphia vireos. Along the way you may encounter such common residents as the wood duck, bald eagle, red-shouldered hawk, sandhill crane, barred owl, yellow-bellied sapsucker, pileated woodpecker and sedge wren. With luck you might find sharp-shinned and Cooper's hawk, wild turkey, blue-headed vireo, Carolina chickadee, hermit thrush, orange-crowned warbler, ovenbird, grasshopper sparrow and Baltimore oriole. Look for swallow-tailed kites in spring and summer. The Kilbee Tract portion of the Forest borders the St. Johns River near its confluence with the Econ. Drive partway onto the property and then hike the entrance road one mile to the end where the floodplain opens, offering a view of the river and its waders, raptors, shorebirds and ducks in fall and winter. Most of the common species are usually well represented here. Before taking the hike, you might want to scope the river from the boat launch at the SR 46 Bridge. If it looks like birding the river will be productive, then the hike is definitely worthwhile. The trail is in full sun, often with standing water, so plan accordingly. The Kilbee Tract is a wildlife management area open for seasonal hunting. Primitive camping is permitted. Located near Eastern Florida State College and the Indian River, this 92.14 acre regional park features wetlands and lakes with walking bridges connected to 3-miles of paved walking trails. Facilities include an observation tower, pavilions, 2 multi-use fields, 2 lighted soccer fields and concession, 3 lighted youth softball fields and concession, 4 lighted adult softball fields and concession, restrooms and parking. This new Brevard County recreation complex resulted from a unique partnership between the Brevard County Natural Resources Watershed Management, Brevard Community College, the City of Titusville, the St. Johns River Water Management District and the Parrish Medical Center. In addition to providing recreational opportunities, the park was engineered to prevent polluted storm runoff from entering the Indian River Lagoon. Habitats include artificial lakes and wetlands (salt marsh and mangroves), plus hardwood and sabal palm hammocks. Look for Wood Storks and other waders (such as Roseate Spoonbills on occasion), Mottled Ducks, gulls and terns. Walk the trails through the hammocks for seasonal songbirds such as Painted Buntings and warblers. One of the park's best features is a five-story observation tower with a commanding view of the lagoon and wetlands. Paved, level paths throughout most of the park make traveling easy for persons of all mobility levels. The complex is located immediately behind the community college's "gymnatorium," home of the Space Coast Birding and Wildlife Festival, one of the largest birding festivals in the nation. Directions: From I-95 north of Titusville, take exit 223 for SR 46. Go east towards Mims on SR 46/W. Main St. for 1.6 mi., then turn right (south) on US 1/SR A1A. Drive for 1.6 mi, and then turn left (east) on E. Jay Jay Rd. The entrance is 0.4 mi. ahead on the right at Snowy Egret Dr. The causeway across the Indian River Lagoon to the seashore and refuge. Nationally recognized as one of America's most beautiful beaches, Canaveral National Seashore has been operated by the National Park Service since 1975. Directly adjacent to the Merritt Island National Wildlife Refuge, the Seashore consists of 24 miles of undeveloped beach and wetland environs that stretch from Playalinda Beach in Brevard County northward to Apollo Beach in Volusia County. Here you see the coast of Florida as it must have looked to Ponce de Leon in 1513 - no buildings or seawalls, just sand and dunes. As you turn inland, view the contrast between the natural areas and mankind's most advanced technology - the facilities that launched man to the moon. Canaveral National Seashore offers a rich array of birding pleasures: access to the beach for shorebirds, gulls and terns; elevated platforms on the dune line to scope for migrating raptors along the shoreline and gannets and jaegers out at sea; winding trails through maritime hammock for painted buntings and migratory songbirds; and vantages of the lagoon where waders, shorebirds and rafts of migratory ducks seek shelter and food. The middle section of the Seashore has no vehicular access. A 12-mile dike trail connects the north and south ends of the park, allowing a wilder birding experience while viewing the lagoon, beach and coastal scrub. This property is one of the best sites in Florida to scope offshore for seabirds. You might even spot one of the world's most endangered large whales. Offshore Central Florida waters are calving grounds for the northern right whale. In winter and spring, visitors are sometimes treated to the rare sight of a mother right whale and her calf traveling right down the beach just offshore of the breakers. In the south section of the park, two miles west of Playalinda Beach, Bio Lab Road offers an outstanding opportunity for birding impoundment areas and the south end of Mosquito Lagoon from a vehicle. Limited backcountry camping is allowed on the beach November 1 through April 30 and on designated islands all year, by permit only. There is more to Canaveral National Seashore than just its beaches; more than 100 Native American Indian shell middens are located within the park. One of these is the 60-foot-high Turtle Mound, which is also one of the best sites on Florida's East Coast for viewing raptors during migration. Named for its resemblance to a giant turtle and used as a navigational aid for centuries, Turtle Mound shows up on Spanish maps as early as the sixteenth century. Boardwalks lead to the top of the Mound where a scenic panorama of estuary, islands, beaches and ocean is revealed. A few miles south of the Mound, the road to El Dora Statehouse slices through thick coastal strand scrub habitat and maritime hammock. Typical of an 1800s Florida settler's home, the El Dora Statehouse stands as one of the last remnants of an old Florida waterway community. The beautifully restored Statehouse has been turned into a museum, filled with artifacts and memories of an earlier era -- a time of hardy settlers who braved the wild lands of Florida before the creation of air conditioning and mosquito control. On the Oak Hill waterfront, Seminole Rest is one of the oldest archaeological sites in Florida -- a 4,000- year-old Timucuan Indian shell midden topped by two historic Florida pioneer homes. A paved trail with interpretive signage featuring detailed paintings of French artist Jacques le Moyne encircles the midden. The renditions, painted in 1564, depict the daily life of some of Florida's First People. Additional kiosks feature old photographs of the Snyder family, who lived atop the midden and protected it from the fate of those nearby -- becoming fill for railway and road projects. You won't want to miss the flock of white pelicans that spend the winter loafing on a shell bar directly behind Goodrich's Seafood Restaurant just north of Seminole Rest. Directions: The south entrance is reached from Titusville. Take SR 406 east and veer right (east) onto SR 402. Proceed through Merritt Island NWR to the Canaveral National Seashore entrance station. Watch for Florida Scrub-Jays near the entrance station. The north entrance is reached from New Smyrna Beach. Go east on SR 44 to Highway A1A. Go south on A1A seven miles to the park entrance. Entrance fee is $5.00 per car. To get to Seminole Rest, go east from US Highway 1 at the blinking caution light in Oak Hill. Seminole Rest is on the right, just after the road bends to the left and begins running north along Mosquito Lagoon. For more information on Canaveral National Seashore, visit www.nbbd.com/godo/cns or www.nps.gov/cana/, or call 321- 267-1110. 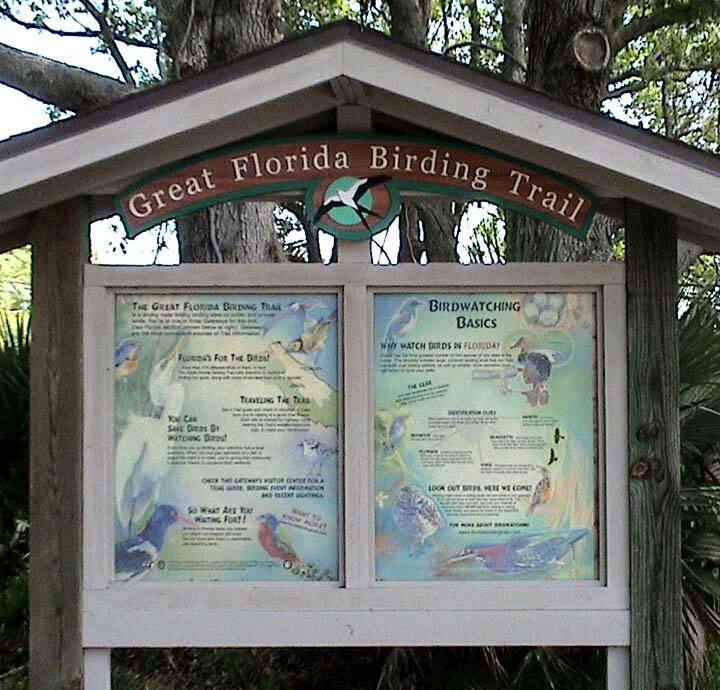 The Merritt Island National Wildlife Refuge is a designated gateway to the East Section of the GFBT, where visitors can find more detailed information and materials than at other Trail sites. Staff members at the Refuge Visitor's Center are available to answer questions and provide information about birding classes and events as well as a Great Florida Birding Trail guide. The Visitor's Center also offers a great selection of field guides and area information. Loaner binoculars are available at the Visitor's Center for anyone to check out. Every Thursday, Saturday and Sunday morning, free birding field trips are led by Refuge volunteers during peak birding season. Located east of Titusville, Merritt Island has the distinction of being the home of NASA's Kennedy Space Center, the Merritt Island National Wildlife Refuge (MINWR) and the Canaveral National Seashore. In cooperation with NASA, the U.S. Fish and Wildlife Service has managed MINWR since the lands were purchased in 1963. The second largest refuge in Florida, MINWR and its surrounding waterways offer a sanctuary for a rich abundance of plants and animals from both the tropical and temperate climate zones; along its western edge is the Indian River Lagoon, North America's longest and most biologically diverse estuary. The Refuge consists of 140,000 acres of salt marsh, freshwater impoundments, brackish estuaries, hardwood hammocks, pine flatwoods and scrub. Blessed with so many diverse habitats, MINWR remains unsurpassed as a refuge for endangered wildlife. At 21 species, it supports more threatened and endangered animals than any other single refuge in the continental U.S., including the Florida manatee, bald eagle, wood stork, gopher tortoise and eastern indigo snake. More than 6,000 alligators call the Refuge home. Birding a variety of habitats on the Refuge can be exceptionally rewarding, particularly from November through March. Impoundments and salt marshes offer the most diversified viewing opportunities. One of the most popular areas of MINWR is a seven-mile, one-way driving loop. The world-renowned Black Point Wildlife Drive offers visitors an opportunity to observe birds and wildlife without ever leaving their vehicles. Wading birds, shorebirds, waterfowl, gulls, terns, rails, sparrows, blackbirds and raptors can be easily seen along the drive, often right next to the road. For this reason, the Refuge is also a popular destination for wildlife photographers. Near the middle of the Wildlife Drive, there's an observation tower. The Cruickshank Trail, a five-mile walking trail around impounded salt marsh, starts at this point. Make sure you go to the Refuge Visitor Center to obtain a map of the Refuge. The Peacock's Pocket and Gator Creek dike roads offer more opportunities to bird and photograph impoundments from a vehicle. The Shiloh Marshes and L Pond dike roads are currently closed to the public while being refurbished. Both roads are scheduled to reopen in fall 2004. When all of the road repairs are completed, MINWR will offer more than 40 miles of drivable dike roads for unparalleled wildlife viewing. Within the Refuge's hardwood hammocks, you'll find excellent birding for warblers and other songbirds during spring and fall migrations. The Oak Hammock and Palm Hammock Trails are located one half-mile east of the Refuge Visitor's Center. Pine flatwoods host breeding populations of bald eagles, which nest annually in large pine trees in the winter months. One of the last three strongholds of the threatened Florida scrub-jay is found in the Refuge's fire-dependent scrub habitat. Another observation tower is located on the Scrub Ridge Trail, just north of the intersection of SR 406 and SR 3. A half-dozen scrub-jay families maintain territories along the Scrub Ridge Trail. You might want to try getting out on the water to really enjoy the birds and wildlife of Merritt Island. A low- profile kayak offers the opportunity to get close to wildlife and enjoy stunning scenery from a whole new perspective. The big attraction for birders in boats is a large spoil island that lies just west of the Haulover Canal. One of the most significant colonial waterbird nesting islands in the state, Mullethead Island and its surrounding grass flats provide an excellent opportunity to view a variety of birds from the water's level. 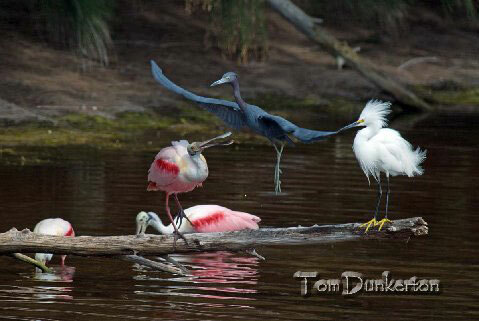 In late spring, there's a good chance you'll see roseate spoonbills and reddish egrets feeding their young. Other birds that nest on the island include great blue, little blue, tricolored and black-crowned night-herons; great and snowy egrets; white ibises; brown pelicans; and double-crested cormorants. Prime viewing time is March through July. In addition to wading birds in spectacular breeding plumage, look for numerous shorebirds, gulls and terns loafing on sandbars on the south side of the island. In winter, lesser scaups, white pelicans, common loons, red-breasted mergansers and horned grebes may also be seen on the open waters of the lagoon. Mullethead Island can be scoped from the northwest side of Haulover Canal. Turn west on the dirt road immediately north of the bridge (across from Manatee Viewing Platform) and follow the road around until it ends at the shoreline of the Indian River Lagoon. A dirt road system on the southeast side of the canal passes through prime scrub habitat where Florida scrub-jays may be seen. Check the power lines on the south side of the canal for scrub-jays. In addition to the birds, there's plenty to see in this area. Wildlife is abundant along mangrove shorelines, and crystal clear water allows for great views of vibrant beds of colorful seagrasses and marine life. Look for sting-rays, horseshoe crabs, mullet, spotted sea trout and redfish. Bottle-nosed dolphins can often be seen frolicking near the canal's approaches, and the deeper waters of the canal provide shelter for manatees in warmer months; they can often be easily seen from a viewing platform near the drawbridge over the canal or in Bair's Cove boat launching area located southwest of the bridge. Local outfitters offer kayak rentals and guided tours that highlight outstanding features along the entire length of the Indian River Lagoon. For those who don't care to paddle a kayak, there are other ways to experience nature first hand, including boat tours and sailboat rentals. Directions: From Titusville, go east on SR 406 across the Indian River. At the big curve, stay to the right and take SR 402 to get to the Visitor's Center; to get to the Black Point Wildlife Drive, go left on SR 406. To get to Haulover Canal, take SR 406 until it ends at SR 3; turn left and go north on SR 3 for 4.5 miles. For information on the refuge, visit www.nbbd.com/godo/minwr or www.fws.gov/merrittisland or call 321-861-0667. Hatbill Road runs through the center of Seminole Ranch Conservation Area, ending at the St. Johns River and a Brevard County park, Hatbill Park, which can be good for sunrise and early morning birding before the airboaters arrive. Limpkins are possible here as well as wood ducks, mottled ducks and other waterfowl, shorebirds, wading birds and raptors. There are bobwhites and meadowlarks, red-winged blackbirds, boat-tailed and common grackles, fish crows and anhingas. You can usually find cardinals, shrikes, eastern towhees and vireos here. Working along the road, you may see blue jays, tufted titmice, robins, cedar waxwings, sedge and marsh wrens, swamp and savannah sparrows, and four species of woodpecker (pileated, red-bellied, downy and flicker). Red-headed and hairy woodpeckers and yellow-bellied sapsuckers are occasionally seen. You can usually find pine, prairie, black-and-white, palm, yellow-throated and yellow-rumped warblers in season. Many others may be found in migration. Blue-headed and white-eyed vireos are here as well as red-eyed vireos in migration. Blue-gray gnatcatchers, brown-headed nuthatches, barred owls, great horned owls and eastern screech-owls are also found here. The ability to identify birds by their calls can be very helpful at this site. Some of the trails may be seasonally flooded. Camping is permitted at both Seminole Ranch CA and Hatbill Park. Directions: The North Tract of Seminole Ranch is bisected by Hatbill Road, which intersects SR 46 on the south side, 4.1 miles west of the I-95 and SR 46 interchange. Look for signs for Loughman Lake Lodge and the Seminole Ranch CA. The South Tract of Seminole Ranch is accessed via SR 50. The trailhead is directly south of the parking area for Orlando Wetlands Park (see directions for OWP). For camping information at Hatbill Park, call 321-264-5037. Near a sheltered marina on the Indian River Lagoon. The City of Titusville's Blue Heron Water Reclamation Facility offers another outstanding opportunity for birding from a vehicle. A wide variety of waterfowl, wading birds and marsh birds congregate in the created wetlands at Blue Heron. Constructed wetlands are engineered systems created from uplands that have been designed to utilize the natural processes of wetlands to assist in the polishing of wastewater effluent. Many of them have become outstanding birding sites; such is the case with Blue Heron. This 292-acre site, situated midway between the Indian River Lagoon and the St. Johns River, contains seven cells, or ponds, that are rich in wildlife. Outstanding diversity of plant species, along with the continuously increasing plant density within Blue Heron has encouraged an impressive number of wildlife species to utilize the wetlands as part of their habitat. Deer, wild hogs, bobcats, alligators, birds, otters, turtles and frogs prowl the dikes. Least bitterns in particular are doing well here. David Simpson, a local naturalist, spotted 91 of them one spring day. American bittern, purple gallinule, hairy woodpecker, limpkin, sandhill crane, roseate spoonbill, black-crowned night heron, black-necked stilt, bald eagle, peregrine falcon, bobolink and gull-billed tern are just a few of well over 100 bird species sighted here. Directions: From Titusville, take SR 50 west. Turn south on Deep Marsh Road, about a half-mile west of I-95. The site is at the end of the road. Normally the gate is closed. Ring the buzzer on the left and someone will open the gate. The facility is open for birding from 7AM-3PM on weekdays. Appointments may be made to access the wetlands on weekends. It is advisable to call ahead at 321-383-5642. Sign-in and sign-out at the office is required. Description: The "flagship" Enchanted Forest Sanctuary was the first property purchased by Brevard County's Environmentally Endangered Lands (EEL) Program. Four miles of well-marked hiking trails guide you through pine flatwoods, hardwood/palm hammocks, wet prairie and scrub habitats. The best birding action occurs on the Tomoka Trail (boardwalk) and Biodiversity Loop, especially during spring and fall, when migratory songbirds such as Magnolia Warblers and Louisiana Waterthrushes pass through, though other trails are also worth checking. Woodpeckers include Downy and Pileated, plus Northern Flickers and Yellow-bellied Sapsuckers. Be on the lookout for Cooper's Hawks as they dart through the trees in search of avian meals. Lucky birders may detect Eastern Screech-Owls and Northern Bobwhites. An eye-catching, butterfly/dragonfly garden behind the education center is sure to please most anyone. Watch for Long-tailed Skippers, Queens, White Peacocks, Gray Hairstreaks and others amongst the asters, passion vines, partridge peas, milkweeds and cassias. The education center has trail maps and interpretive exhibits; call ahead about guided tours and special programs. Cart tours for the mobility impaired are available by prior arrangement. Friends of the Enchanted Forest website. Directions: From I-95 northbound near Titusville, take exit 212 for SR 407/Beeline Ext. and drive northeast for 2.7 mi. Turn right (east) on SR 405/Columbia Blvd. and go 1.0 mi. to the entrance road on the left (north). From I-95 southbound, take exit 215 for SR 50/Orlando Rd. Turn left (east) and go 0.4 mi. to SR 405. Turn right (east) and drive 3.4 mi. to the entrance road on the left (north) side of the road. Canaveral Marshes Conservation Area borders the eastern edge of the St. Johns River. The Indians called it "Welaka", the River of Lakes. It has been characterized as one of the "laziest" rivers in the world. From its origin west of Vero Beach to its mouth in Jacksonville, the St. Johns will average a drop in altitude of about one inch per mile. Measuring 310 miles in length, Florida's longest river is one of only three major rivers in the U.S. that flows from south to north. With a recorded history that is one of the earliest in the U.S. -- pre-historic settlements in South Titusville date back more than 8,000 years BC -- the St. Johns has earned the nickname "Florida's First Highway." The earliest settlers, the Timucuan Indians, found an incredible river of plenty with abundant fish, game and fresh water. Later, Spanish settlers and other European groups used the river as a major transportation route with paddlewheel boats bringing tourists to the center of the state and carrying away citrus and other agricultural products grown on the rich floodplain along the shores of the river. Northeast Florida's rich heritage is mirrored along the banks of the St. Johns, with its intricate webs of cultural, biological and natural diversity. Officially designated as an American Heritage River by President Clinton in 1998, the St. Johns River quietly offers its beauty to anyone who cares to discover it. The Upper Valley of the St. Johns is remote and untamed, 83 miles long and 22 miles wide. West of the Space Coast, the river is still surrounded by immense floodplains covered with sawgrass, chord grass, arrowhead, willows, hammocks and hardwood forests. In spring and fall, wildflowers bloom profusely in vast fields along the floodplain. Yearly water levels fluctuate dramatically, depending on rainfall. During rainy season, serpentine channels disappear as the river swells over the floodplain, forming an immense body of water with just the tops of palm trees and cypress visible. Largemouth bass and crappie are abundant, and fishing is terrific, especially when the water is low and fish are concentrated in deep holes along the channels. If you're into birding, the St. Johns River is a paradise. In addition to massive numbers of wading birds, raptors such as hawks and eagles frequently can be seen soaring over the river or perched in snags along the floodplains. Toward evening, thousands of birds return to their nesting areas to roost. Other animals that frequent the river include deer, otter, bobcat, an occasional bear and sometimes the elusive Florida panther. Of course, there's always the lurking gator, hidden along the banks or slowly swimming in the river. Sometimes when the river level gets very low, hundreds of these reptiles, some quite large, can be seen along the riverbanks sunning themselves. Living relics from the late Mesozoic era, alligators have existed for 140 million years. Although birding from the roadside near bridges and hiking in the various conservation areas and reserves that line the St. Johns can be quite good at times, one of the most exciting ways to bird the St. Johns is by airboat. In addition to the open river and unlimited marshes, several large Indian middens are accessible by boat. Middens often provide resting space and feeding areas for neotropical migrant songbirds. Where you go and what you will find will largely depend on water levels. You should see alligators, raptors and lots of wading birds at any time of the year. Birding is best, of course, during fall, winter and spring. Bald eagles, northern harriers, white pelicans, mottled ducks, blue-winged and green-winged teal, wood storks, sandhill cranes, greater and lesser yellowlegs and moorhens are fairly common. Roseate spoonbills, peregrine falcons, merlins, crested caracaras, wild turkeys, black skimmers, long-billed dowitchers, limpkins, wood ducks, black-crowned and yellow-crowned night-herons, soras, king rails and marsh and sedge wrens are a possibility. Short-tailed hawks and snail kites are rare, but still occasionally seen. There are two ways to take an airboat ride. One way is to spontaneously drop In at Midway Fish Camp on SR 50 or Lone Cabbage Fish Camp on SR 520 (both are on the St. Johns River) and take the next airboat that leaves. Reservations are required for small airboat tours. See the listings for operators in the Outdoor Providers section of this website. For more information on the St. Johns River, visit www.stjohnsriveralliance.com or www.marshbunny.com. The Pine Island Conservation Area is a dynamic landscape supporting a diverse plant community and abundant wildlife. Adjoining the Merritt Island National Wildlife Refuge, the 879-acre conservation area is jointly owned by the Brevard County Environmentally Endangered Lands Program (EEL Program) and the St. Johns River Water Management District. Two hiking trails accessed from a trailhead 0.5 miles from the entrance parking area offer moderate 1.0 mile and 1.5 mile walks through pine flatwoods and hydric hammock habitats. Each trail features overlooks providing visitors with panoramic vistas of shallow water feeding habitat of wading birds, shorebirds and waterfowl. Biking is allowed on established trails. The coastal location and diversity of habitat types provide many opportunities for viewing wildlife, which are enhanced by permanent blinds accessible by foot or canoe. Wading birds are common, with fall migration bringing numerous species of waterfowl and shorebirds, as well as white pelicans that feed and rest in shallow waters of the marsh pond and the Indian River Lagoon. Pine flatwoods provide habitat for resident and migratory songbirds. Red-tailed hawks, ospreys, and black vultures are often sighted, and occasionally bald eagles are seen soaring over the conservation lands. Alligators and aquatic turtles are also common inhabitants of the marshes and expansive open waters. Endangered manatees frequently seek refuge in the peaceful waters of Sam's Creek/Rinker Canal. They are often observed resting at the north end of the canal, particularly during winter and early spring months. Directions: From the intersection of SR 520 and SR 3 (North Courtney Pkwy) on Merritt Island, go north on SR 3 for five miles to Pine Island Road. Turn left and go west on Pine Island Rd. and follow it 2.5 miles to the parking lot at the end. A kiosk with a map shows the canoe trails. For information, visit Pine Island Conservation Area, or call 321-255-4466. A nature center and boardwalk through a hardwood hammock. Click map icon for a Google map to the West Orange County birding sites. Nearby, Canaveral Marshes Conservation Area is a 6,741-acre property owned and managed by the St. Johns River Water Management District. Most of the property borders the east side of the St. Johns River and is predominantly freshwater marsh. Hiking access is from SR 50, about a mile west of the Blue Heron Wetlands. The eastern portion of Canaveral Marshes near the Great Outdoors RV Park can be very good for waterfowl, shorebirds and songbirds in winter, depending on the water levels. Volunteers who conducted monthly surveys in 2001 and 2002 recorded approximately 154 species of birds on this property. The marsh west of the adjoining Great Outdoors resort has been especially productive, particularly in the fall. At a small pond just inside the property there have been days when a couple of hundred green-winged and blue-winged teal, along with smaller numbers of mottled duck, northern pintail and northern shoveler, can be found. North and south of this pond are upland hammocks. The north hammock is on a Native American shell midden. The pond is part of the St. Johns River floodplain, and when water is low there are many sparsely vegetated depressions and secondary channels that are attractive to shorebirds and other waterfowl. The higher marsh areas are good for sedge and marsh wrens. Elsewhere on the floodplain, American bittern, fulvous whistling-duck, long-billed dowitcher, stilt sandpiper, gull-billed tern, bald eagle, northern harrier, sharp-shinned hawk, crested caracara, black crowned night heron, king and Virginia rails, American pipit, Wilson's snipe and peregrine falcon may be found. This is a hiking area where you can expect to occasionally get your feet wet. Directions: Access is from a parking area on the south side of SR 50 approximately three miles west of I-95. For more information and a map of the area, visit Canaveral Marshes Conservation Area, or call 386-320-4404. Part of Orange County's Green PLACE conservation lands program, this newly-opened site (July 2010) was purchased in 1999 to protect the Floridan aquifer and habitat within the St. Johns River basin. It also provides superb wildlife viewing opportunities, with numerous habitat types (scrub, scrubby flatwoods, strand swamp, freshwater marsh, hardwood hammock and pasture). The Florida Sandhill Crane, a threatened, non-migratory subspecies numbering about 6,000 individuals, nests here. Look for songbirds in migration such as American Redstart and American Robin in winter. Year-round residents include Osceola Wild Turkey, Barred Owl, Cooper's Hawk, White Ibis, Brown-headed Nuthatch, Eastern Towhee, Bachman's Sparrow and resident woodpeckers. Bald Eagle, Sherman's Fox Squirrel, Gray Fox and Gopher Tortoise occur here as well, along with Eastern Tiger Swallowtail, Gulf Fritillary and Zebra Heliconian. Trails may be flooded at times, so bring appropriate footwear. Take plenty of water, and sun and bug protection. The county offers educational programs here each month; call for details. Directions: From I-95 south of Titusville, take exit 215 for SR 50 and head west for 10.7 mi. to the town of Christmas. Turn right (north) on CR 420/SW Christmas Rd. and go 1.6 mi. The preserve entrance is on the left (west) side of the road. Located a few miles west of the St. Johns River off of SR 50, Tosohatchee Wildlife Management Area is one of Central Florida's premier hiking locales. Sixty miles of trails wind through this 30,701-acre reserve, offering plenty of opportunity for birding, hiking, biking, primitive camping, nature study, horseback riding and fishing. A decent road system offers the opportunity for birding from a vehicle. Shaped by alternating cycles of fire and flood, Tosohatchee Wildlife Management Area is a mosaic of marshes, swamps, pine flatwoods and oak hammocks. Deep inside the reserve, Jim Creek flows through some of the last remaining virgin cypress swamps in all of Florida. Bordering 19 miles of the St. Johns River in eastern Orange County, the reserve is named for Tootoosahatchee Creek, which flows through its northern portion. The abundance of wildlife must have been attractive to the Native Americans who lived at Tosohatchee long before the arrival of the first Europeans. Mounds within the reserve indicate that Timucuan Indians occupied the area for several centuries. Seminoles lived here, too, fiercely defying the U.S. government's attempts to eradicate them. The Tosohatchee marshes are feeding areas for wading birds and, during winter months, host large numbers of migrating waterfowl. Forested uplands support deer, bobcats, gray foxes, wild turkeys, woodpeckers, hawks, owls and songbirds. Some of the threatened and endangered species found at the reserve include bald eagle, wood stork, eastern indigo snake, gopher tortoise and, on rare occasions, the Florida panther. Birds of interest include Bachman's sparrow, brown-headed nuthatch, eastern bluebird, red-headed woodpecker and Florida sandhill crane. Tosohatchee is a great site for those interested in butterflies and dragonflies, especially in late summer and fall when wildflowers and native grasses are in full bloom. Primitive camping is permitted. Directions: From Titusville, take SR 50 west to the town of Christmas. Look for a brown sign for Tosohatchee. Turn left and travel three miles south on Taylor Creek Road. The entrance will be on the left. There is a modest entrance fee. Make sure you have some dollar bills to put in the iron ranger located on the right just inside the entrance. There is some seasonal hunting on this property. For information, visit myfwc.com/recreation/tosohatchee/, or search Tosohatchee, or call 407- 568-5893. Between Titusville and Orlando lies a top-notch property which includes several miles of the Econlockhatchee River (and its tributaries and canals), plus flatwoods, wet prairie, hardwood hammock and freshwater swamp. The site is managed for Red-cockaded Woodpeckers (RCWs); look for white-painted cavity trees on the red, yellow, and green loop trails. Other flatwoods breeding species include Northern Bobwhite, Hairy and Red-headed Woodpeckers, Brown-headed Nuthatches and Bachman's Sparrows. Regular surveys have turned up other birds of interest such as Limpkins, Sandhill Cranes, Merlins, Short-tailed Hawks, Crested Caracaras, Swallow-tailed Kites and Henslow's Sparrows. Eastern Bluebirds are common along the powerline crossings, and 23 warbler species are possible. Three primitive camping areas and 16+ miles of multi-use loop trails are available (some may be flooded at times). Consider backpacking or biking to explore this vast territory; a trail map is available at the entrance kiosk or visit the SJRWMD website. Birding by boat is allowed on the lake at the entrance (check for occasional rails). The preserve is botanically rich, and offers great butterfly viewing as well, with rarities such as Little Metalmark, Florida Dusted Skipper and Eastern Wood Nymph. Zebra Swallowtail, Monarch, Whirlabout and Little Yellow are common. Directions: From Titusville, head west on SR 50, past the town of Christmas. Turn left and go east on SR 520 for about two miles. Turn right (west) into the Wedgefield subdivision on Macon Parkway. Turn left on Bancroft Blvd., right on Meredith Parkway, then left on Dallas Blvd. The parking lot is 1.6 miles south of the Meridith/Dallas intersection, on the right. For more information and a map of the area, visit Hal Scott Regional Preserve and Park, or call 386-329-4404. Adjacent to (and once part of) the Hal Scott Regional Park and Preserve (site #92), the newly-opened (2009) Pine Lily Preserve is managed by Orange County as part of their Green PLACE conservation lands program. Cypress domes, pine flatwoods, hardwoods, freshwater marsh and riverine swamp habitats along Long Branch (a tributary of the Econlockhatchee River) harbor a rich assemblage of flora and fauna. Start at the parking area at CR 13, which has a picnic area and trailhead. There are 2.3 miles of foot trails (no bikes or horses allowed), including a connecting trail which runs south to Hal Scott's red trail loop. Brown-headed Nuthatches, Northern Bobwhites, Common Nighthawks and Common Ground-Doves reside in the flatwoods; Sandhill Cranes forage in the wetlands and Barred Owls call out along the swamp's edge. The hardwood hammocks support Palm Warblers, American Robins and Ruby-crowned Kinglets in winter and breeders like White-eyed Vireos in summer. Short-tailed Hawks, quite rare in Florida, have been recorded here. Look for botanical treasures such as the preserve's signature species, the fire-dependent and state-threatened Pine Lily ­ a beacon of fiery red amongst the otherwise green landscape. A formal butterfly inventory has not been conducted at this site yet, but many of the species found at the neighboring Hal Scott property (Barred Yellow, Gray Hairstreak, White Peacock and Carolina Satyr) presumably occur here. Directions: At the intersection of SR 50/E. Colonial Dr. and CR 13 in Bithlo (west of Christmas), turn south on CR 13. The parking area is 1.7 mi. ahead on the left (east) side of the road. A short distance from Tosohatchee, Orlando Wetlands Park (OWP) is a large treatment facility that uses water plants to polish already treated wastewater before discharging it into the St. Johns River. Nearly 1200 acres of beautiful created wetlands include cattail and bulrush marshes, mixed and open marshes, hardwood swamps and a lake. Visitors are sure to see numerous wading birds, and often purple gallinules, least and American bitterns, red-shouldered hawks and king rails can be found foraging in the marshes. Ospreys and bald eagles feed throughout the wetlands complex, and purple martins nest in tree cavities each spring - one of the only places east of the Mississippi River where they nest in anything other than man-made houses! Sunset brings on a spectacular sight as thousands of wading birds move from daytime feeding areas to their nightly roosts. A variety of other animals abound at OWP including deer, otters, raccoons, opossums, bobcats and wild hogs. OWP is also a great site for butterflies and dragonflies. A trail that begins at the parking lot and winds east around Lake Searcy then north through a hammock can be good for migratory songbirds in season. Watch for ducks and shorebirds in the wetlands in fall and winter and large flocks of migratory tree swallows coming in to roost in late fall and early spring. South of Orlando Wetlands Park, nearly 5 miles of the Florida Trail winds its way through jungle-like hydric hammocks and dense oak hammocks along the floodplain forests of the St. Johns River in the South Tract of the Seminole Ranch Conservation Area. Hiking is, for the most part, on raised exposed dikes. Plan for full sun and insects and watch out for summer thunderstorms. Large alligators also inhabit these wetlands and may bask on the dikes. While no cause for alarm, they should be neither approached nor fed. THIS PROPERTY IS CLOSED SEASONALLY, FROM NOVEMBER 15 UNTIL FEBRUARY 1 EACH YEAR. Directions: From Titusville, take SR 50 west to the town of Christmas. Turn right (north) onto Ft. Christmas Road (CR 420) and go 2.3 miles to Wheeler Road. Turn right on Wheeler and go east for 1.5 miles. The parking area will be on your left. For more information visit the Orlando Wetlands Festival web site or www.nbbd.com/godo/orlandowetlands/ or Orlando Wetlands Park or call 407-568-1706. 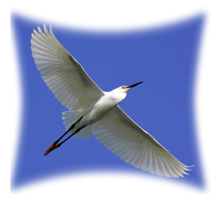 Click map icon for a Google map to the Central Brevard County birding sites. On the shore of the Indian River Lagoon with a small sheltered bay & 140 foot pier. The rock jetty (a great place to look for purple sandpipers) at Jetty Park is the last land that ships pass as they leave Port Canaveral, headed out to sea. One of the world's busiest ports, Canaveral is recognized as the port that offers the most recreational opportunities for visitors in the state of Florida. Port Canaveral is the world's only quadra-modal port, utilizing transportation by water, air, land and space. This area is consistently productive for many gull and tern species and other goodies. The beach just south of the jetty is a preferred loafing place - it is not unusual to see hundreds of birds standing on the beach, providing a great opportunity for comparison of age and seasonal variations in plumages and molt sequences. As you bird the jetty area, look across the Trident Submarine turning basin for winter birds. Several avian rarities (for this area) have visited in recent years, including common eider and red-necked grebe. In addition to regular waterbirds, magnificent frigatebirds, northern gannets, jaegers, Sabine's gulls and other seabirds may be seen offshore in winter. On the beach look for sanderlings; willets; piping plovers (rare); black-bellied plovers; red knots; ruddy turnstones; laughing, ring-billed, herring, Bonaparte's, great black-backed and lesser black-backed gulls; Caspian, Forster's, royal, common, least and sandwich terns; and black skimmers. Occasionally you may see a shrimp boat dragging near the shore with hundreds of birds following. These should be scanned for rare oceanic birds. A small hammock on-site can be good for songbirds during migration as well as introduced species like monk parakeets. Look north along the coast to see the land areas that form Cape Canaveral. When the air is clear you can see the missile gantries and the Cape Canaveral Lighthouse. You may see freighters and tankers from many countries, fishing boats of all types, missile tracking boats, a wide variety of U.S. military vessels and some of the world's most elegant cruise ships either coming into the Port or preparing to depart for fun-filled days at sea. When visiting Port Canaveral, you don't want to miss the Port Canaveral Locks, which connect the Atlantic Ocean to the Banana River estuary. Wildlife is abundant with plenty of manatees, dolphins and birds to see. When the water is clear, large redfish and snook are visible. Check out the rocks for shorebirds like ruddy turnstones, black-bellied plovers and spotted sandpipers. Numerous brown pelicans and double-crested cormorants loaf around the pilings, and great blue herons, great egrets, wood storks and snowy egrets feed along the shore. Sunset brings on a gathering of black-crowned and yellow-crowned night-herons. Directions: From north Cocoa, go east on SR 528 from I-95 or U.S. 1. After you cross the Banana River, follow the signs for the South Docks and go into the south entrance to the Port. Turn right on George King Blvd. and follow the signs to Jetty Park. Entrance fee is $5.00 per car. To get to the Port Canaveral Locks from the south entrance to the Port, turn left on Mullet Drive. The road winds around and passes under a drawbridge. Canaveral Locks are at the very end of Mullet Drive. There is a gate, but you can walk through and stand on an observation area. It should be accessible at sunrise. On the Banana River with tidal mudflats and shoals. Near Port Canaveral with a great variety of water birds. In a public park that features a pier jutting into the Atlantic Ocean. On Cocoa Beach, Lori Wilson Park has the last large piece of maritime hammock and undeveloped coastal scrub remaining in the area. This hammock is a magnet for migratory songbirds and painted buntings. Springtime songbird migration fallouts occur in April and can garner day lists of about 15 warbler species. Elevated boardwalks wind through the hammock, allowing close-up views of the songbirds as well as beach access for shorebirds and seabirds. The park's on-site nature center provides an opportunity to learn how habitats like maritime hammock and coastal scrub are struggling to survive with continued coastal development. Directions: From SR 520 in Cocoa Beach, travel south on Highway A1A for 3.5 miles. The park is on the left (east) side of the road. For information, visit Lori Wilson Park, or call 321-633-1874, 321-868-1122. On the shore of a large inland lake. Now also known as "Ritch Grissom Memorial Wetlands"
Viera Wetlands is a series of connected ponds created to treat wastewater from the Central Brevard area. Since opening in 2001, this site has rapidly gained recognition as a premier birding destination. Raised dikes offer an excellent opportunity for birding from a vehicle. There are observation towers that look out over the ponds. During fall and winter, a remarkable diversity of bird species uses these wetlands and nearby prairie hammocks and cabbage palm savannahs. An active bald eagle nest is visible from the dike road, a family of crested caracaras maintains a territory around the wetlands, and northern harriers course just above the marsh vegetation and pasture grasses. Thousands of wintering ducks concentrate here, including green-winged and blue-winged teals, northern shovelers, gadwalls, American wigeons, mottled ducks, mallards, hooded and red-breasted mergansers, lesser scaups, ring-necked ducks, northern pintails, buffleheads and ruddy ducks. Canada geese sometimes use the artificial marshes during winter and as many as 14 black-bellied whistling-ducks now regularly use the wetland system. A series of ponds on the north side of the complex can be spectacular for shorebirds when water levels are low, especially during migration. Black-necked stilts nest here in spring and summer. This site has become a hot spot for rarities - you never know what might show up. The first U.S. sighting of a mangrove swallow was recorded here in November 2002 when sharp-eyed field trip leader Murray Gardler spotted the bird when he stopped by to investigate a flock of Mexican cave swallows (a Brevard County first record) that had been seen on a Space Coast Birding & Wildlife Festival field trip the day before. 8/11 -- The new, paved entry road into Viera Wetlands is now open. It is a straight shot from the west end of Wickham Road, skirting the water treatment facility, then turns abruptly into the wetlands parking area. Nice addition to the site. Click map icon for a Google map to the Southern Brevard birding sites. Large community park with scrubby flatwoods, open playing fields & xeric hammock. Mornings are best. There is a 4/10 mile elevated boardwalk that is an in-depth, interpretive, native plant trail. The first discernable channels of the St. Johns River (Three Forks Run) arise within the marsh south of Lake Hell 'n' Blazes, hence the name Three Forks. The 52,000 acres of the Three Forks Marsh Conservation Area comprise a significant portion of the Upper St. Johns River Basin Project. The original floodplain communities of this area were severely impacted by diking and draining for agricultural uses. Implemented by the St. Johns River Water Management District (SJRWMD) and the U.S. Army Corps of Engineers, the project is designed to reduce flooding, restore and maintain natural hydrologic cycles, enhance native habitat for fish and wildlife and protect water quality. The Upper Basin Project is a model for the much larger project, the restoration of the Everglades. At Three Forks Marsh, a vast network of levees is being constructed to impound the water runoff from neighboring agricultural lands. Much of the work has already been completed, and 15 miles of dike trails are now open to the public. 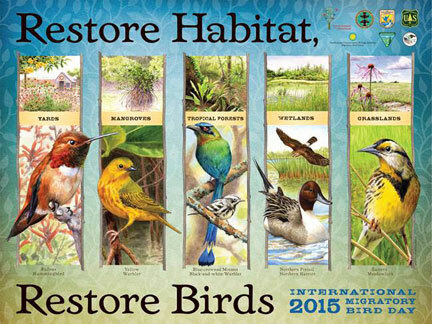 Restoration has already greatly improved habitat for waterfowl, shorebirds, wading birds, raptors, river otters and alligators. There is seasonal waterfowl hunting on this property. Directions: From I-95, Exit 173, take CR 514 (Malabar Road) west until it dead ends (about eight miles) at the Thomas O. Lawton Recreation Area. Park entrance will be on your left. For information and maps, visit Three Forks Marsh Conservation Area, www.marshbunny.com, or call 321-676-6614, 386-320-4404. For hunting information call 352-732-1225. Turkey Creek Sanctuary (an Audubon of Florida-owned sanctuary) is well known as a hot spot for warblers and other neotropical migratory songbirds. Its songbird list alone has more than 30 species, including Canada, prothonotary, golden-winged, chestnut-sided, Nashville, hooded, worm-eating, cerulean, Swainson's, yellow-throated, blackburnian and Tennessee warblers as well as waterthrushes and ovenbirds. Migration at this site is most heavily concentrated in October and April, and its songbird counts receive statewide recognition during those months. Turkey Creek has a variety of habitats including sand pine scrub, mesic hammock, hydric hammock, palmetto scrub and some open grassy areas. Part of this area is viewed from a raised boardwalk. Some of the most productive birding is along the jogging trails - check out both. Turkey Creek is a blackwater creek, and the hydric hammock surrounding it supports such bird species as Carolina wrens, redstarts, ospreys, owls, hawks, egrets, anhingas, herons and cormorants; American white pelicans winter at the mouth of the creek. Other species seen here include quail, eastern towhee, blue and rose-breasted grosbeak, pileated woodpecker, yellow-bellied sapsucker, indigo and painted bunting, red-eyed, blue-headed and white-eyed vireo, yellow-billed cuckoo and Baltimore oriole. As you pass the deeper areas of the creek, look for large swirls of water, which indicate the presence of manatees. These gentle creatures can be seen munching water plants along the creek banks. This is also the best area for waterthrushes. Directions: From I-95 in Palm Bay, take Exit 176 (Palm Bay Road) and go east to Babcock Street. Turn right and go south on Babcock. Turn left onto Port Malabar Blvd. and continue east one mile to the Palm Bay Community Center on the right. Parking for the sanctuary is behind the Community Center. For more information, call 321-676-6690 or visit Turkey Creek Sanctuary. Florida's endemic Scrub-Jay and many scrub species. The high-quality flatwoods and scrub at this sanctuary are home to Florida Scrub-Jays, Great Horned Owls, Hairy Woodpeckers and Gopher Tortoises. The 3-mile, red loop trail has the best birding (but little shade), while the 1.5-mile, white trail loop offers some shade and mostly pine-dependent species such as Brown-headed Nuthatches, Eastern Towhees and Bachman's Sparrows. Depression marshes and bay swamps dot the eastern and northern portions of the sanctuary, providing feeding areas for ducks (Green-winged Teal, Northern Shovelers and Wood Ducks), as well as wading birds (Yellow-crowned Night-Herons, Wood Storks and Snowy Egrets). Be alert for birds of prey such as American Kestrels, Sharp-shinned Hawks and Northern Harriers. Look for Yellow-throated Warblers, Chuck-will's-widows, and Indigo Buntings in summer, and Wild Turkeys year-round. A few Red-cockaded Woodpeckers have been detected feeding on the south side of the sanctuary, but nesting has not occurred. Seasonal migrants such as Louisiana Waterthrushes, Blackpoll Warblers and Painted Buntings have been known to drop by the small patches of oak hammock in spring and fall. Following heavy rains, portions of trails may flood at times (be prepared). The entrance kiosk has trail maps; trails are well-marked. Bring plenty of water and sun protection. Directions: From I-95, take exit 173 at SR 514/Malabar Rd. and go east for 0.6 mi. Turn right (south) on SR 507/Babcock St. and go 8.6 mi. Next, turn left (east) on Micco Rd. ; the entrance is 0.5 mi. ahead on the left (north) side. Alternate: from the intersection of US 1 and Micco Rd. in the town of Micco, drive west on Micco Rd. for 6.9 mi. The parking area is on the right (north) side. Located on a St. Johns River floodplane. On the Indian River Lagoon. Boats & kayaks can be rented. Another part of Brevard County's Environmentally Endangered Lands (EEL) program and the Archie Carr National Wildlife Refuge complex, this parcel features a 0.75-mile hiking trail through coastal strand, oak scrub, maritime hammock and mangrove swamp. Park at the Juan Ponce De Leon First Landing Park on SR A1A (restrooms available, plus views of pelicans, gulls and terns) and cross the highway on foot (watch for traffic) to the northern trailhead. Or, park your bicycle at the southern trailhead a few hundred yards to the south. A canoe-tie up on the lagoon side provides yet another route for entering the sanctuary. 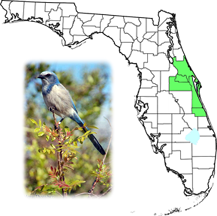 Florida Scrub-Jays (rare) occur sporadically near the northern trailhead. Common Ground-Doves and Loggerhead Shrikes may be found along the hammock edges or openings. The wind-sculpted live oaks can be fairly good for songbirds in migration, with Black-throated Blue Warblers, American Redstarts and Painted Buntings. Check for Belted Kingfishers, Ospreys, wading birds (Wood Storks, Great Blue Herons and the occasional Roseate Spoonbill) and shorebirds at the observation platform on the Indian River Lagoon. Guided nature hikes can be arranged; call for details. Description: Another part of Brevard County's Environmentally Endangered Lands (EEL) program and the Archie Carr National Wildlife Refuge complex, this parcel features a 0.75-mile hiking trail through coastal strand, oak scrub, maritime hammock and mangrove swamp. Park at the Juan Ponce De Leon First Landing Park on SR A1A (restrooms available, plus views of pelicans, gulls and terns) and cross the highway on foot (watch for traffic) to the northern trailhead. Or, park your bicycle at the southern trailhead a few hundred yards to the south. A canoe-tie up on the lagoon side provides yet another route for entering the sanctuary. Florida Scrub-Jays (rare) occur sporadically near the northern trailhead. Common Ground-Doves and Loggerhead Shrikes may be found along the hammock edges or openings. The wind-sculpted live oaks can be fairly good for songbirds in migration, with Black-throated Blue Warblers, American Redstarts and Painted Buntings. Check for Belted Kingfishers, Ospreys, wading birds (Wood Storks, Great Blue Herons and the occasional Roseate Spoonbill) and shorebirds at the observation platform on the Indian River Lagoon. Guided nature hikes can be arranged; call for details. Directions: From Melbourne, take US 1 south to US 192. Turn left (east) and go 2.4 mi. across the Melbourne Causeway to SR A1A/S. Miramar Ave. Turn right (south) and go 6.2 mi. Parking is on the left (east) side of SR A1A at First Landing Park. From I-95, take exit 180 for US 192 and proceed as above. From Melbourne, take US 1 south to US 192. Turn left (east) and go 2.4 mi. across the Melbourne Causeway to SR A1A/S. Miramar Ave. Turn right (south) and go 6.2 mi. Parking is on the left (east) side of SR A1A at First Landing Park. From I-95, take exit 180 for US 192 and proceed as above. This aptly-named sanctuary protects the largest, intact maritime hammock in Brevard County. The site has a 3.5-mile foot path (no bikes) with two trailheads (350 yards apart) on SR A1A, both with bicycle racks. Start at either end and hike westward towards the Indian River Lagoon, watching the gnarled oaks for migratory vireos, warblers, tanagers and thrushes in spring and fall. Eastern Screech-Owl is possible year-round. On the north side, a new trail extension leads west, then northward, to ponds with Anhinga, Black-crowned Night-Heron, Tricolored Heron, Roseate Spoonbill and White Ibis. Mangroves along the lagoon are regenerating thanks to the county's extensive habitat restoration efforts; exotic plant removal on the sanctuary is exemplary. The lagoon offers Osprey, gulls and terns, plus occasional glimpses of Atlantic Bottle-nosed Dolphin and West Indian Manatee. Other wildlife species on the property include Giant Land Crab, Northern River Otter, American Alligator and Bobcat. On the south side of the sanctuary, a shaded pond overlook has a diversity of herons and egrets when water levels are suitable. The beach can be accessed from the north trailhead by crossing SR A1A (mind the traffic). Call ahead to arrange a guided hike for your group. Directions: From Melbourne, take US 1 south to US 192. Turn left (east) and go 4.1 mi. across the Melbourne Causeway to SR A1A/S. Miramar Ave. Turn right (south) and go 10.4 mi. Parking is on the right (west) side of SR A1A at the northern trailhead. Alternate: from I-95, take exit 180 for US 192 and proceed as above. Description: Part of the Archie Carr National Wildlife Refuge complex, this diverse site stretches from the Atlantic Ocean to the Indian River Lagoon. It features a new, state-of-the-art Management and Education Center with interpretive exhibits and nature programs, a 1-mile hiking trail west of SR A1A through maritime hammock and mangrove swamp, plus spectacular views of the beach and lagoon. The oaks shelter woodland migrants in season, and don't miss the fascinating and colorful Giant Land Crabs! On the beach, expect shorebirds such as Ruddy Turnstone and Sanderling, along with Osprey, gulls, terns and Brown Pelican. The center's expansive deck and observation platform are good for scoping sea-faring species--lucky birders may spy a Parasitic Jaeger on occasion amongst the gulls. Short boardwalks and trails through coastal strand lead north and south of the center for additional viewing opportunities. Explore the lagoon by kayak (bring your own) via the launch on the south end of the sanctuary. Habitat restoration is ongoing; many invasive nonnative species such as Brazilian pepper have already been removed. Electric carts for the mobility impaired are available with advance notice. Guided sea turtle walks are given in June and July (call well in advance for reservations). Directions: From I-95 in Melbourne, take exit 180 and head east on US 192/SR 500. Go across the Melbourne Causeway to SR A1A. Turn right (south) and drive 14.5 mi. The education center is on the left (east) side of SR A1A; the hiking trail is across the street (west side). On Mondays, holidays and after hours, parking for the trail access is available at Bonsteel Park, 500 ft. south of the education center. Adjoining the southeast portion of Three Forks Marsh, the T.M. Goodwin Waterfowl Management Area features 10 impoundments managed intensively for waterfowl, wading birds and shorebirds and a semi-permanent flooded marsh, which is managed as a reservoir. An observation tower overlooking Lake Goodwin offers great, unobstructed views of the surrounding marshlands. Walk the dikes between impoundments for good looks at dabbling duck species in the winter, including shoveler, wigeon, teal, pintail and gadwall as well as coot, moorhen, purple gallinule, American bittern, sora and king rail. Mottled ducks can be found year-round, and black-bellied whistling-ducks are possible. Look for wading birds such as wood storks, limpkins, white and glossy ibises, herons and egrets; and black-necked stilts, snipes, greater and lesser yellowlegs, dowitchers and other shorebirds. Northern harriers fly regularly over the marshes in winter and, during hawk migration in October, join red-shouldered and red-tailed hawks, peregrine falcons, merlins and kestrels. Summer is the best time to spot swallow-tailed kites and roseate spoonbills. White-tailed deer are common on the dikes and in the marshes. Alligators, river otters, bobcats, wild hogs and raccoons occur regularly here. The road into the area can also be good for everything from swallow-tailed kites to bobwhites to crested caracaras. Walking, bicycling, horseback riding and boating are all permitted. This area is closed to birders when seasonal hunts are going on, so call in advance for access information. Directions: From I-95 in Palm Bay, take Exit 173 (Malabar Road) and go 0.25 miles east to Babcock Street (CR 507). Turn right and go south on Babcock for approximately 11 miles. Turn right onto Fellsmere Grade Road just after crossing the C-54 Canal. From the intersection of 1-95 and CR 512 (Exit 156), head west for three miles to CR 507 (Babcock Street). Turn right (north) and, after five miles, turn left (west) onto Fellsmere Grade Road, just south of the C-54 Canal. Go all the way to the end of the dirt road (about six miles). Follow signs to the site entrance from the Stick Marsh boat ramp. Goodwin Marsh is north of the Stick Marsh across the C-54 Canal. The entrance to the north tract of St. Sebastian River Buffer Preserve is on the east side of Babcock Street, just north of the C-54 Canal. For recreation information, visit T.M. Goodwin Waterfowl Management Area or call 321-726-2862. Click map icon for a Google map to the Indian River County birding sites. The open grassy forests of longleaf pine that once made up most of Florida can still be appreciated today at St. Sebastian River State Buffer Preserve. The 22,750-acre Preserve is the largest upland property in public ownership in the Indian River/South Brevard County region. This site also contains good examples of scrub and the only undeveloped sandhill habitat in Brevard County. The sandhill area supports about 25 breeding pairs of Florida scrub-jays as well as gopher tortoises and indigo snakes. Many sought-after pinewoods specialties can be found here. Bachman's sparrows, eastern bluebirds, brown-headed nuthatches, Florida scrub-jays and red-cockaded woodpeckers can all be found on the northeast portion of the horse trail accessed via Stumper Flats Trail on the east side of the property. On the west side, near the intersection of Buffer Preserve Drive and CR 507, the Green, Blue and Red Trails wind through hydric hammocks which are excellent for migratory songbirds and swallow-tailed kites. Bald eagles nest on the property and American kestrels and loggerhead shrikes are regularly spotted. Seasonal wetlands host a variety of wading birds, including wood storks and roseate spoonbills. Florida sandhill cranes breed on ponds in pastures and open pinewoods. Sixteen species of frogs have been documented on the Preserve. Most of these, including the Florida gopher frog, probably breed here. Several species of rare plants can also be found. In winter, manatees congregate at the spillway of the C-54 Canal and can be seen from the viewing platform at the spillway or from the canal levee. Watch for deer, turkeys and bobcats along the roads or forest edges near dawn and dusk. Forty miles of trails offer plenty of opportunity for visitors to enjoy the diversity of this beautiful wild property. The St. Sebastian River and its surrounding bottomland forests and floodplain swamp make up the Preserve's eastern boundary. Canoeing, boating and fishing on the St. Sebastian River are also popular activities. A Visitors Center is located in the north parcel of the Preserve. The south entrance to the property, off CR 512 east of I-95, has more open space with good views of raptors and meadowlarks. Primitive camping is allowed at designated sites. Florida's most popular state park, Sebastian Inlet State Recreation Area is the best birding location on Brevard County's south beaches. The park includes three miles of beautiful Atlantic Ocean beach, unspoiled dunes, coastal hammocks, tidal pools, salt marsh, world-class fishing and plenty of wildlife. When approaching from the north, watch for a trail on the west side of A1A about 200 yards before you actually turn into the park. The trail winds through a lovely hammock, which leads south along the Indian River shoreline, then circles back to the main trail. This area can be superior for migrant warblers and scaring up chuck-will's-widows in late winter and spring. As you drive into the park, check the tidal pool northwest of the bridge. At low tide, the pool is a feeding ground for many wading birds, shorebirds, gulls and terns. Some unusual species have been spotted here; sandwich terns frequent the area in winter. American oystercatchers and reddish egrets may be seen. Look carefully around the rocky area leading to the inlet for purple sandpipers (check the jetties, too). Birding here is best in the early morning before the area becomes crowded. West of the tidal pool is a grassy area edged by woods; check here for migrants, woodpeckers and raptors. Look in the mangroves at the water's edge for black-whiskered vireos in spring and summer. The western foot trails along the small spit of land that juts into the lagoon offer a good vantage point to scope for ducks, loons and grebes during fall and winter. East of the tidal pool is the North Jetty, one of the most popular fishing and surfing spots on Florida's East Coast. Look along the beach for shorebirds like turnstones, willets and plovers and watch for gulls and terns. On northeast and easterly winds in winter, look for pelagic species such as jaegers, gannets and scoters; frigatebirds and tropicbirds are a possibility. On the southwest side of the bridge, just past the fishing museum, there's a dock where wood storks congregate. West of the campground, there's a spit of land that's good for shorebirds. A trail 0.4 miles south of the fishing museum winds through diked mangrove impoundments, which are good for migratory songbirds. Watch for manatees and green and loggerhead sea turtles moving through the inlet or feeding on sea grass in the lagoon's shallow waters. Boat tours to nearby Pelican Island National Wildlife Refuge run daily. Camping is permitted. Directions: Sebastian Inlet is located on Highway A1A, 17.5 miles south of the U.S. 192/A1A intersection in Melbourne Beach. From the CR 512/Sebastian/Fellsmere exit on I-95 (Exit 156), go east 2.5 miles and turn right on CR 510 which goes through Wabasso and crosses the Indian River. Go all the way to Highway A1A and then go north. You will pass the entrance to Pelican Island NWR on the left before you get to Sebastian Inlet. There is a $5.00 entrance fee. For more information, visit www.floridastateparks.org/sebastianinlet, or call 321-984-4852. At the St. Johns River's headwaters, the 54,458-acre Blue Cypress Conservation Area is part of the Upper St. Johns River Basin Project. Comprised of a mosaic of marshes, lakes and cypress swamps, Blue Cypress is the most pristine portion of the Upper St. Johns River Basin. The Blue Cypress Water Management Area is a rectangular impounded marsh area designed to filter agricultural run-off before being released into the pristine Blue Cypress Conservation Area. The southern end of the management area is off limits to airboats and boats with motors greater than 10 HP. From the parking lot of the Blue Cypress Recreation Area on CR 512, you may walk in several directions. One of the westbound dikes will offer more remote, sometimes higher quality birding. However these paths are narrower with irregular surfaces. A north-south dike offers a smoother walking surface, although the path is more exposed and birds are harder to spot. This site, as are other sites that feature raised exposed dikes, is best in fall, winter and spring. Summer is hot on the dikes and mosquitoes can be challenging. The area supports several wading bird rookeries, and the eastern portion contains foraging and nesting habitat for the endangered snail kite. Other wetland dependent species found here include all of the egrets and herons (including both night-herons), glossy and white ibises, purple gallinules, limpkins and wood storks. Wood ducks and Florida mottled ducks are found year-round, and the marshes are used extensively in fall and winter by migratory waterfowl and shorebirds. Bald eagles, hawks, vultures, anhingas, ospreys and crested caracaras are commonly seen. American and least bitterns, king rails, soras and fulvous whistling-ducks may be viewed here as well as river otters and alligators. There is seasonal hunting in the area, but not on the levees. Primitive camping is allowed at designated sites. Directions: Blue Cypress Recreation Area can be reached from the CR 512 and SR 60 exits off I-95. From I-95, take the CR 512 Exit (Exit 156) and go west. Go through the town of Fellsmere and continue south on CR 512. The recreation area is 1.5 miles north of SR 60. You can also take the SR 60 (Vero Beach) exit from I-95. Go west on SR 60 for 7.5 miles and turn right onto CR 512 and travel north two miles. To access the western levees, parking is available on the north side of SR 60 two miles west of the CR 512 intersection. For more information, visit Blue Cypress Conservation Area, or call 386-329-4404. A National Historic Landmark, Pelican Island is America's first National Wildlife Refuge, a place where time has virtually been frozen. For the past 100 years, Pelican Island has exemplified our great American ideal -- that wildlife and wild places should be protected in perpetuity. At the turn of the twentieth century, the island became the last known nesting site for brown pelicans on Florida's East Coast. Museum collectors and plume hunters had taken a serious toll on Florida's avian inhabitants, killing millions and bringing most of them close to extinction. Here you can learn first hand how this tiny island, brown pelicans and one man inspired our nation's wildlife conservation movement 100 years ago, how the community has fought for its protection from various threats over the years and the conservation challenges it faces as we move into the twenty-first century. New public facilities on Pelican Island National Wildlife Refuge were opened on March 14, 2003 in partnership with Indian River County as a part of the Centennial celebration of Pelican Island and the National Wildlife Refuge System. These new facilities are providing the public with the first opportunity in its 100-year history to view the Pelican Island rookery from land, without the use of a boat, and explore other areas of the National Wildlife Refuge. New facilities include a quarter-mile boardwalk and 18-foot-high observation tower to view Pelican Island, two 2.5-mile salt marsh impoundment foot trails, interpretive signs and information kiosks. Recreational opportunities at the new Refuge facilities include hiking, birdwatching, wildlife observation and photography. Bird species possible include brown and white pelicans, all of the egret and heron species, wood storks, roseate spoonbills, gulls and terns, cormorants and various shorebirds. In addition to brown pelicans and numerous species of egrets and herons, wood storks and American oystercatchers nest on the island. Painted and indigo buntings are often seen along the road in the refuge's old orange groves and near the boardwalk. f Directions: From Melbourne Beach, take Highway A1A south. Cross Sebastian Inlet and continue south. 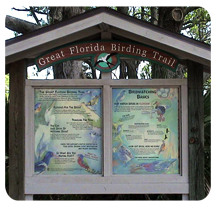 Facilities are located on the west side of A1A on the north end of historic Jungle Trail which, in itself, is a great birding location, especially during migration. For directions from I-95 Exit 156, see the above directions for Sebastian Inlet. Local boat, kayak and canoe tour vendors offer rentals or daily trips to view Pelican Island. Reservations are strongly suggested, as times and availability may vary due to seasonal demand and weather. For more information, visit www.fws.gov/pelicanisland/, or call 772-562-3909.